Sirius is the brightest star in the night sky. It has been an object of worship in some ancient civilizations including the Arabs. In the Quran Surah 53 An-Najm (the Star) Allah (God) tells us that He is the Lord of Sirius. In other words Sirius was created by God and so Sirius is not worthy of worship, rather God is. 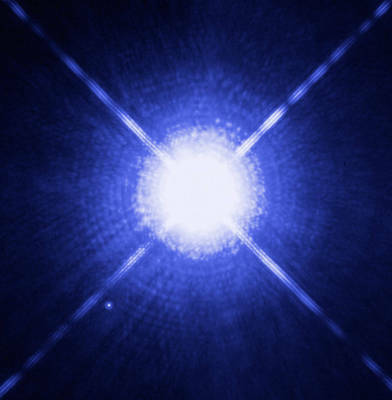 Modern telescopes confirm that Sirius is not one but actually two stars. Sirius A and Sirius B complete an orbit around each other over 49.9 years. Their distance varies from 8.15 AU to 31.5 AU over this period. The minimum distance between Sirius A and Sirius B in literature is listed as both 8.1 and 8.2 AU. Therefore we found it reasonable to take their mean 8.15 AU as the distance between them. What is an AU? The average distance between the sun and the earth is called 1 AU or Astronomical Unit. It is the distance that light will travel in 8 minutes and 20 seconds ( 8.33 minutes ), equal to 149597870.7 km or nearly 150 million Kilometers. Recently an interesting fact was discovered in the Quran. The distance between the Earth and Moon and the Earth and Sun have been found to be encoded as the number of letters and words between the mention of Earth, Moon and Sun in the Quran. This word count or letter count corresponds to how many of these celestial bodies or their orbital distances can be placed between them and the Earth. For instance 102 moons fit between the Earth and the Moon, and 107 suns fit between the Earth and the Sun and 389 earth lunar distances fit between the Earth and the Sun. See Appendices 1 and 2. What is unique to this method is that it is not dependant on man made units of distance but on the size of the respective celestial bodies or orbital width. As mentioned in Appendix 1, Allah is pointing us towards natural units of measurements that are independent of human developments. Based on the above the question arises that does the Quran encode the much larger and gigantic distance between Sirius and the Earth ? This distance is about 81 trillion kilometers by human measurements or more than half a million times the Sun is far from us. If we were to apply the above finding about the distances of celestial bodies in the Quran to the distance between Earth and Sirius then we will need to find out the actual distance of the Sirius binary system from Earth and then see if the number of words between the Quran mention of Earth and Sirius matches this distance. The calculations below show that the distance from Earth to the Sirius Binary System corresponds to the number of words between the word Earth in Quran 2:107 and the word Al-Shera (or Sirius) in 53:49 in a UNIT equal to the width or size of the binary system itself (In this case the distance from Sirius A to Sirius B would be the size of this system). Number of Sirius Binary Systems that can be placed between this system and Earth = 8.6 light years / width of the Sirius Binary System = 541534.7650894792 / 8.15 = 66,445.98344656187 rounded to 66446 Sirius Binary Systems. Using the Quran Code Software it was calculated that there are 66480 words between Earth in 2:107 and Sirius in 53:49. Comparing the above, there is a mere difference of 34 or .051% between the number arrived in Step 3 and the number of words between the mention of Earth in 2:107 and Sirius in 53:49. This difference is likely not significant considering we do not know the exact minimum distance between Sirius A and B down to precise decimal fractions due to limitations in our techmology. As science progresses, we may be able to fine tune the above calculations more accurately which may be even closer to the one in the Quran. While working on the above calculations it was noticed that the Quran verses which mention the Earth and Heavens belonging to Allah may act as markers in calculating distances between Earth and other heavenly bodies. A good example is Ayat ul Kursi where the line " Lahu ma fis samawate wama fil ardh" marks the begining of the count from the mention of Earth to the that of the Sun and hence the relative distance between them. See appendix 1 and 2. The very first Ayat in the Quran where Earth and Heavens are mentioned together as belonging to Allah is 2:107. This is likely the verse for counting the distance between Earth and Sirius in the Quran for the following reasons. It is the farthest from the mention of Sirius as a marker which makes sense since Sirius is many many times away from the Earth than the Earth is from the Sun or moon. It is more than half a million times away from the earth than the Sun. It appears that Ayat 2:107 hints towards our solar system or the Earth - Sun pair thru a numerical signature : A pair of 2 heavenly bodies ( that is the Earth and Sun ) which have a distance of 107 times the size of the larger celelstial body ( the Sun ) between them. It would seem logical to start our word count from this hint of the Solar system to the mention of Sirius. Both verses 2:107 and 53:49 have other similarities. Both say that these heavenly bodies are Allah's and both have the root word "Anna" in them. One concern is that why the minimum Sirius A-B width of 8.15 AU is relevant to the above calculations and not the maximum width of 31.5 AU ? It is certainly possible that the larger width of the binary system may also be relevant to such a calculation but we don't know that yet. Perhaps there is a hint in the Quran in another Ayat of the same Surah Najm to use the minimum width of the binary system. In this verse the arabic word Qaws is sometimes used as a measure of distance and Adna means lesser or smaller. There is another amazing discovery regarding Sirius in the Quran where the duration of the orbit of Sirius A and B and its double bow shape is encoded in the same Surah An-Najm. Please see Appendix 4 for the website link to this amazing discovery. The Quran is the last Scripture from Allah ( God ) that has been among us for more than 1400 years. Recent scientific discoveries in the Quran affirm its Divine origin. And Allah ( God ) knows best ! Copyright 2015. Muhammad Khan. Last updated January 9, 2016. Also special thanks to Br. Hatim Zaghloul for providing his initial guidance for the astronomy calculations as well as the articles in the appendices. Special Acknowledement for Br. Pehlivan for being the first one to discover the method for Earth - Moon distance in the Quran and sharing this knowledge.